Also available in vertical configurations! Applies the correct amount of fluid for your small press window and high-speed, short feed length applications when combined with a SPR-2000™or SPR-2000-JR™. This 1 to 4 in. wide (25 mm to 102 mm) unit consistently applies the correct amount of fluid. Reduces fluid consumption (customers report savings of 50%); improves part quality; increases production rates; decreases part and shop cleaning with its precision application of fluids. Horizontal model uses a fluid controller to inject lubricant into a dispenser tube inside the roller. Small holes in the tube evenly distribute the lubricant along the length of the roller. Vertical model uses a baffle positioned inside each of the rollers near the top. Every time the fluid controller injects lubricant into the dispenser tube, the fluid spreads across the baffle and is redirected to the outside of the roller. Gravity pulls fluid down the length of the cover. Draws the fluid along the length of the roller with the wicking action of the polyester felt or polyurethane foam roller cover. Lubricant goes on smoothly and evenly across the top and bottom of the stock. Unist ships parts within 24 hours. Fluid supply systems, roll covers, spray nozzles, sheet guides, etc are in stock and ready to ship. Lets you start saving now . Ask our Unist lubricant consultants to show you how a Mini-Roller™ can precisely apply your lubricants. Contact us today. 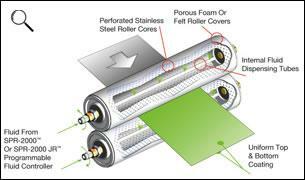 All Uni-Roller systems feature a patented, internally fed roller design. This is the key to uniform and efficient fluid application. As illustrated, inside each of the rollers there is a dispenser tube with several small holes spaced along its length. Every time the fluid is injected into the dispenser tubes from the fluid controller, it is dispensed evenly across the inside of the roller through these holes.